The proposal on mobilizing WTO tools comes from the presidential expert department. The Russian presidential administration has suggested that the government carry out a comprehensive analysis of existing U.S. trade restrictions against Russian products from the standpoint of making more intensive use of WTO tools, a source in the financial and economic wing of the government told Interfax. 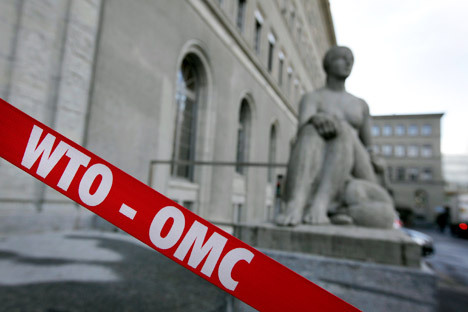 The proposal on mobilizing WTO tools comes from the presidential expert department, which it forwarded to the presidential control department, the body that monitors implementation of instructions from the head of state, which in turn forwarded it to the government apparatus with a request to instruct the ministries to take expert department's position into account. The expert department formulated its proposals having examined the government report on the issue of eliminating discriminatory restrictions on imports of Russian goods to the U.S., which the Cabinet is preparing in accordance with a presidential instruction of August 1, 2012. The expert department notes that the U.S. continues to apply anti-dumping duties on Russian mineral fertilizer producers (urea and ammonium nitrate) and metallurgical products (hot-rolled steel and silicon metal). In connection with thick sheet steel and uranium production from Russia, the Russian-American agreements on halting anti-dumping investigations applies (producers accept voluntary limits on prices and supplies in order to avoid duties). The expert department points out that in 2014, the U.S. withdrew from a similar agreement on hot-rolled steel, as a result of which the anti-dumping duty on Russian production was 185%. The presidential expert department believes that almost all these discriminatory measures were applied without taking into account Russia's status as a market economy and has signs of violating Russia's rights as a WTO member. The source noted that at the beginning of the week the government sent an instruction to the ministries concerned, including the Economic Development Ministry, which is in charge of external trade and WTO issues. "It was considered important to recommend to the government carrying out a comprehensive analysis of the restrictions imposed by the U.S. from the standpoint of more intensively using WTO tools, including in the context of the review planned by the U.S. of anti-dumping duties concerning Russian-produced hot-rolled steel, urea and ammonium nitrate," the source said, citing the government letter.